We've had the digital switchover, there are no more analogue TV signals in my region of England, so why did I buy an analogue TV adapter and why am I so happy with my purchase? Well, as far as I can tell this is the cheapest way to get Sky Plus and a Wii on a computer monitor when my PC is turned off. If you've got a lovely computer monitor and you just can't bear the thought of having another, inferior TV screen taking up space just so you can watch a bit of telly, this is for you. Although the Gadmei 5821G doesn't support Freeview, it does support the old analogue TV system which is what Sky satellite boxes use to pipe TV to upstairs bedrooms, studies and kitchens, if the TV aerial sockets in your house are wired up right. 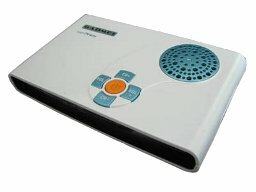 If you use a Magic Eye to remote control Sky from another room, then this box is what you need to watch Sky on your computer monitor without having to have your PC switched on. It costs 30 quid from Amazon. The G suffix indicates Great Britain (PAL-I); there are other variants for other national TV standards. The box also supports composite video and left/right audio, which means with a composite-to-scart adapter (not included), you can plug in any scart equipment such as a Nintendo Wii or an old VCR/VHS video recorder. You could also chain a cheap-end scart Freeview box or DVD player, but as it's composite/scart, you won't get HD. The output is a standard SVGA socket. It isn't DVI, but you have to remember this is a product for analogue video signals so a digital connector wouldn't magically make the picture digital quality. My computer monitor has both SVGA and DVI inputs, so I just plugged the Gadmei into the SVGA input on the computer monitor and it Just Worked. There is no SVGA monitor cable in the box, but most computer monitors come with those already. Sound is supplied either through the internal speaker, or through a standard 3.5" headphone socket. The tiny, tinny internal speaker isn't up to much but you can hear what is being said; for just listening to the news or children's TV it would be okay, but for an immersive movie experience with sound effects or music it won't cut it. Realistically you want to plug this into a set of PC speakers or a stereo amplifier. Image quality is pretty good. As with any analogue connection it can be affected by the cables passing near other electrical equipment, mains adapters, other wires etc, so if you get ghosting or interference, try relocating both your SVGA cable and your aerial cable away from other kit. However, if you are expecting HD quality you are not going to get it, this is analogue. What you get is an excellent SD analogue picture, as good as you remember analogue TV being on the best CRT TVs the 1990s; bright, steady and clear. It supports widescreen, you can either switch it so that your monitor stretches out the full picture, or you can set it to letterbox. Therefore you can have widescreen even on 4:3 output resolutions such as 1024x768. Talking of resolutions, there's a vast number, starting at 800x600 and working up to 1440x900 at 60hz. 75hz is also supported up to 1280x1024. There's also a handy F button on the remote, so if you set the device to a higher resolution than your monitor can accept, just hold down F for 5 seconds and it reverts to Factory settings (800x600 at 60hz). If your monitor was made after about 1990 then this will work with it. It looks great on my modern flat panel Samsung monitor. You can also pass a PC through this box, so you don't need to unplug your PC every time you want to watch Sky. A couple of cables are provided to input your PC's SVGA and stereo audio - basically you can plug your PC into the Gadmei and it passes the signal on to the monitor when the Gademi is switched off. However, the PC adapter cable uses the same socket as the composite video connector so you can't have both a Wii and a PC connected at the same time, you would need to unplug/replug. My solution was to have my PC connected to my monitor's DVI input, then have Sky and an old scart Freeview box running through the Gadmei via the monitor's SVGA input. It's then down to the monitor to switch between the Gadmei and the PC. There are other options for watching telly on a monitor, of course; you could watch TV on your PC using a Freeview USB stick or BBC iPlayer, but I can't be bothered to boot up my PC every time and I don't want the additional noise of the PC's fans going, even if my PC is already pretty quiet. I often want to doze off watching the telly - the Gadmei has a sleep timer too, which you can set from 15 to 180 minutes, after which most monitors will go into standby mode. I'd imagine this would also be a great way to re-use an old SVGA projector to watch a movie or a football match projected onto a big screen! I'm delighted with the purchase, it gives me a good Sky SD picture in my study with my PC turned off, without having to have another screen taking up space.